This tutorial provides you with a foundation for working with Adobe Illustrator layers. It is the eighth lesson in the Adobe Illustrator CS6 Digital Classroom book. For more Adobe Illustrator training options, visit AGI’s Illustrator Classes. Complex illustrations with many components can make it more difficult to work with and select individual components. In this lesson, you will discover how to use Illustrator CS6’s Layers panel to organize and manage your illustrations. You will work with several files from the ai08lessons folder in this lesson. Make sure that you have loaded the ailessons folder onto your hard drive from the supplied DVD. See “Loading lesson files” in the Starting up section of this book. Whether you deliberately work with layers or not, every time you create, import, or paste items in an Illustrator document, you are placing those items on a layer. The default layer that is in every new Illustrator document is called Layer 1. The order in which you add new elements to the document determines their arrangement on Layer 1. The latest additions appear on top of the earlier ones; this is called the stacking order. Just like stacking sheets of paper on your desk, the first one placed appears on the bottom of the stack and the most recent one placed is positioned on the top of the stack. The Layers panel allows you to select an item or items in an illustration, change their stacking order, show or hide them, and lock them. 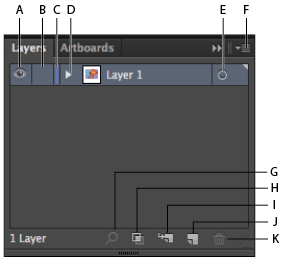 The following exercise will familiarize you with the Layers panel. 1 Launch Adobe Illustrator CS6, if it is not already open. Choose File > Open. In the Open dialog box, navigate to the ai08lessons folder and select the ai0801_done.ai file. Press Open. 2 Visually, the artboard of this done file will remain the same as your start file, but, if you choose Window > Layers, you see that there are three named layers in this document. You will start with a one-layered document and add additional named layers, as well as take advantage of other layer tips and tricks, throughout this lesson. 3 You can choose to leave this finished document open, or choose File > Close to close it now. If you are asked to save this file, choose No. 4 Choose File > Open. In the Open dialog box, navigate to the ai08lessons folder and select the ai0801.ai file. Press Open. 5 Choose File > Save As. In the Save As dialog box, navigate to the ai08lessons folder and type ai0801_work.ai in the Name text field. Press Save, then press OK when the Illustrator Options dialog box appears. 6 Press the Layers button ( ) in the dock on the right side of the workspace to open the Layers panel. A. Visibility column. B. Edit column. C. Selection color column. D. Disclosure triangle. E. Target column. F. Panel menu. G. Locate Object. H. Make/Release Clipping Mask. I. Create New Sublayer. J. Create New Layer. K. Delete Selection. 7 Press the visibility icon ( ) in the Visibility column to the left of Layer 1; all the items that reside on that layer disappear from the workspace. Click in the box once more to make the pieces visible again. 8 Press the empty box to the right of the visibility icon in the Edit column of the Layers panel. The padlock icon ( ) appears. This locks all the items on the layer, making it impossible to select or edit them. Press the padlock icon again to unlock the items on the layer. 9 To the right of the padlock icon is the Selection Color column. The color listed in this column is the color assigned to identify the items on this layer. Each object on the layer will have its frame edges and bounding box appear in the layer color when the item is selected. When new layers are created, the layer colors are assigned in sequence down the list of Adobe system colors. There are 27 named colors to choose from, or you can select Other and specify additional color options. Layer colors can help you to visually categorize graphic elements at a glance. You can change the layer colors to fit your own visual system of organizing. 10 To the right of the Selection Color column is the disclosure triangle. Click the disclosure triangle to see all the individual and grouped items (sublayers) that make up the illustration. 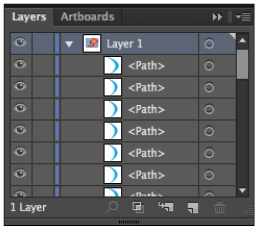 Compound paths, while made up of multiple paths, show up as one item in the Layers panel. Masked items also appear as a sublayer in the Layers panel. The clipping mask and the clipped elements can be revealed by opening the disclosure triangle of the masked group.